There are as many definitions of what constitutes rum as there are countries which make it, but in essence, rum is the spirit distilled from the fermented sugars derived from the fresh juice or molasses extracted from the sugar cane plant. Most of the Caribbean will start to crop sugar cane in February and finish in June or July. The soil type and climate will have an effect on the sugar levels within the cane and ultimately the flavour of the finished rum. The harvested canes are chopped and crushed to extract the juice. This juice can then be used as it is to make rum (what the distillers of the French Caribbean islands call rhum agricole) or boiled into a syrup. After filtration and the removal of the sugar crystals which form as it cools, a thick and sticky, black-brown liquid known as molasses is left. The molasses is diluted with water and wild or specially cultivated strains of yeast are added to begin the process of fermentation. The yeast adds another level of flavour to the molasses and as it grows and consumes the sugars in the molasses it produces alcohol. The action of the yeast within this ‘wash’ produces a number of compounds such as aldehydes, esters, acids and compounds known as congeners, all of which contribute to the complex flavours and aromas of rum. The length and temperature of fermentation also affect the final product. Once fermentation is finished, the now mildly alcoholic (about 7%) wash is ready for distillation. It contains approximately 93% water which the process of distillation will remove to produce a much stronger liquor. The wash is heated in a still, a large sealed kettle. Alcohol boils at a lower temperature than water, so the alcohol vapours are liberated from the wash and captured as what is called the ‘heart’ of a spirit. The complex compounds in the wash developed by the yeast are preserved in this distillate. 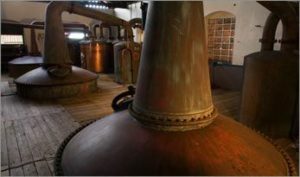 All rums were originally made in pot stills, which are large copper kettles similar in shape to those used in the production of malt whisky. Pot stills are used in a batch system, distilling a single quantity of wash at a time. However, many makers now also use column stills – usually comprising two linked cylindrical ‘kettles’ called the analyser and the rectifier – which can produce a constant flow of rum. The spirit or ‘mark’ produced during distillation is crystal clear un-aged rum (or aguardiente as the Hispanic Caribbean producers call it). To develop further the flavour and colour of the rum it must be matured or ‘aged’. Most rum is aged in oak barrels. After his precious stills, a rum maker’s barrels are his most valuable asset. Whilst in the barrel the rum acts on the oak. Compounds within the wood mix with the rum, contributing further aromas and flavours and gradually turning the rum from clear, to golden and eventually darker brown. The length of time in the barrel and the number of times the barrel has been used both influence the ultimate character of the rum. And so does the local environment. Because of the wonderfully tropical climate of the Caribbean, the ageing process is much faster than that in cooler climes. Some estimates suggest that one year of maturation in the Caribbean is equivalent to three years in a cooler climate – just imagine how good a 15 year-old Caribbean rum can be! During the period of maturation a certain amount of alcohol evaporates from the barrel – what the distillers call the angels’ share. Finally, the aged rums may be blended, an art particularly well advanced amongst rum makers. The highly skilled blender will combine a number of different aged rums to achieve a perfect palette of flavours and aromas, uniting the nature of the cane, yeast, fermentation, distillation, maturation and environment and painting a masterpiece worthy of the title Authentic Caribbean Rum.